These two dukematch levels are both made by the same author. They are very similar looking to each other. Theme is medieval and it's well used. There are flames, some colored lighting, altars, explosion switches etc. Design is good and detailed and dukematch action is mostly fun. Of course I was only able to play these with bots. It was fun as long as I kept bot count over 5. Lots of bots and these levels works well. 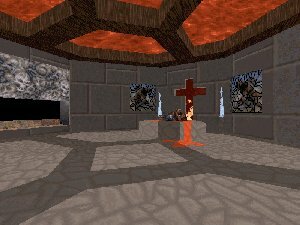 For dukematch lovers these two maps are worth downloading. Single-players might enjoy playing these levels with bots few times. Other players may download these levels only to see some good design.